Thunderbirds play Mission Veterans Memorial in Class 5A Division I state quarterfinals Saturday. SAN ANTONIO – With all due respect to prolific Mission Veterans Memorial quarterback Landry Gilpin, the biggest challenge for the Wagner Thunderbirds in the Class 5A Division I state quarterfinals might be having to wake up earlier than usual on game day. Meeting in the first game of a playoff tripleheader at the Alamodome, the Thunderbirds and Patriots kick off at 10 a.m. Saturday. To hear the Thunderbirds tell it, the early kickoff won’t be a problem for them. After all, the Patriots are getting an early wake-up call, too. Thunderbirds coach Charles Bruce also shrugged off the early kickoff. The 5A Division I state final is scheduled to start at 11 a.m. on Saturday, Dec. 22, at AT&T Stadium in Arlington. Wagner (12-1) has no illusions about the formidable challenge Veterans Memorial (12-1) and Gilpin, a senior, will present. Gilpin’s father, David, is the Eagles’ head coach. Given his leadership and command of the offense, Landy is like a coach on the field. Gilpin amassed 704 yards of total offense in the Patriots’ wild 62-55 victory over Corpus Christi Veterans Memorial in the regional semifinals Saturday night at the Alamodome. Wagner beat Corpus Christi Flour Bluff 49-14 Friday night on the same field. Gilpin completed 21 of 46 passes for 434 yards and five touchdowns in the win over Corpus Christi Veterans Memorial, and rushed for 270 yards and two more scores. For the season, Gilpin has passed for 4,233 yards and 47 TDs and run for 2,158 yards and 32 TDs. In the midst of a historic season, Wagner is one win away from reaching the state semifinals for the first time since it opened in 2005. The Thunderbirds, who played their first varsity season in 2006, won their first district championship this season. They also have set a program record for the most victories in a season. Wagner’s 2010 team reached the state quarterfinals after making the playoffs as a fourth-place team. The Thunderbirds finished 7-7 after having their run stopped by Stevens. Wagner has been dominant in its first season in the University Interscholastic League’s second-largest classification after dropping from 6A to 5A with the UIL’s biennial realignment this year. The University Interscholastic League classifies schools by enrollment every two years. The Thunderbirds have won 11 consecutive games since losing to Judson ISD rival Judson 35-28 in their annual Hammer Bowl. Wagner crushed its eight District 13-5A Division I opponents in rolling to the league championship, outscoring them 522-29 and pitching five shutouts. The Thunderbirds were the highest-scoring 11-man team in the state during the regular season. Wagner opened the playoffs with a 59-7 rout of Harlandale and pulled away from Corpus Christi Ray for a 56-17 second-round victory in Corpus Christi. The Texans stayed with Wagner for a little more than a quarter before the Thunderbirds seized control with a 28-0 run that put them ahead 42-10 with 10 minutes left in the third quarter. Wagner was up 35-10 at the half. As dominant as Wagner has been this season, and considering it lost to unbeaten Judson by only seven points, an argument could be made that the Thunderbirds are the second-best team in the San Antonio area – regardless of class. Wagner hadn’t made the playoffs since 2012, going 13-37 in the ensuing five seasons. The skid began with an 0-10 finish in 2013, Bruce’s first season as head coach. The Thunderbirds went 4-6 last season for the second year in a row. Wagner has a dynamic quarterback of its own, senior Tobias Weaver, a dual-threat operator who has started for the last two seasons. Weaver and Butler, who has rushed for 1,701 yards and 28 TDs this season, give the Thunderbirds one of the best backfield tandems in the state. Given the way the Wagner offense has overwhelmed defenses for most of the season, Veterans Memorial could have a hard time staying close to the Thunderbirds. While teams from the Rio Grande Valley traditionally have fared poorly against San Antonio-area opponents, Bruce remains wary of the Patriots. 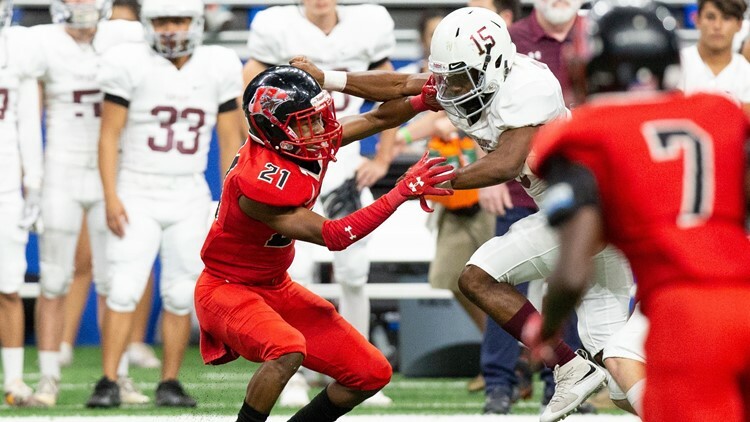 In the two other games scheduled at the Alamodome on Saturday, Judson plays Austin Lake Travis in a 6A Division I state quarterfinal at 2 p.m., and Brandeis meets Austin Westlake in a 6A Division II state quarterfinal at 6.